The rivers of South Africa are bursting with opportunity, but are often overlooked by carp anglers. In the Western Cape there is the Breede River which is 337km in length, stretching from the Skurweberg mountain close to Ceres to Port Beaufort, and up in the Free State we have the Vaal River which is 1 120km in length. 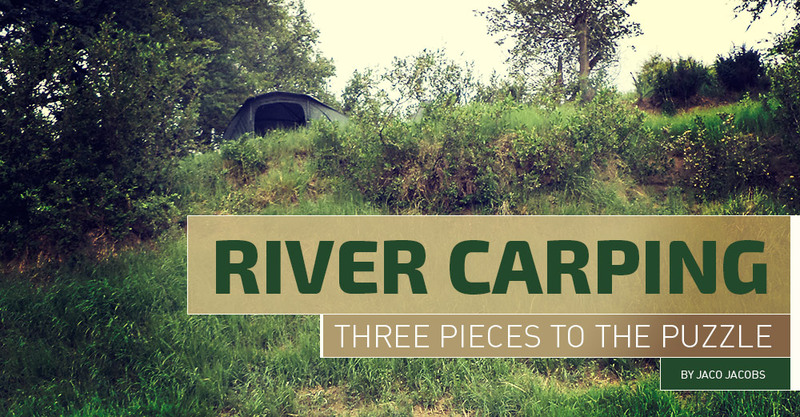 While in most cases the carp are not particularly big, on certain special occasions the river lets you have a peek into what it really has to offer. Those long, hard-fighting bars of gold have found a very special place in my heart and that is what makes me go back every time. Like fishing any other stretch of water, river carping requires proper planning, preparation and a fresh attitude towards your usual tactics. I’d like to touch on a few techniques and tips that I have learned which I have found to be extremely useful while targeting the Vaal River. Location has been discussed on so many platforms that I don’t think it really needs any introduction. However, to catch a special carp from a river you really need to pay attention to your swim. The river carp often have very specific patrol routes. If you can manage to figure out where they are you have already given yourself a big advantage. I like to sit high on the bank and watch for signs of fish. This is especially effective early in the morning and just before sunset. You can learn a lot by just observing. The first thing I noticed while fishing the Vaal River was that the bigger fish were all crashing in the distance, right at the limit of my boilie stick throwing range. Later on it became clear that they were patrolling right behind a very rocky ledge, which runs through most of the stretch of river I fish. If I look back over the past two years of actively fishing the Vaal River there is a definite pattern in where the bigger carp feed. Two particular swims have delivered in excess of 30 20lb carp and one special 30lb. Bait is always an important aspect of carp fishing, but in the river even more so. In my experience, fine seeds like hemp, buckwheat, sorghum and crushed maize become useless due to the current. These seeds are often used to keep the carp in the area occupied and active on your swim for longer periods of time. Bigger particles like maples, maize and peanuts were also problematic for me as they were gobbled up by the small carp in a flash. Boilies seemed to be the only logical answer for me and the quest to construct a boilie to suit the river was underway. My sessions were normally no longer than a weekend, so the boilie had to get the carp into the swim quickly to give me the best possible chance. Therefore, it had to be an attractive bait, without sacrificing nutrition. I boosted the solubility levels to around 30 percent in order to get a fast breakdown. This worked like a charm at first, but it created a new problem of its own. The nuisance fish realised that they could break the baits down quickly. It was the perfect attraction, but they also messed up the hookbaits. These fast-disintegrating baits seemed to lure the bigger carp from beyond the rocky ledges into catchable areas. I baited up heavily (10 to 20kg boilies a weekend) in order to get the carp to feed competitively. This increased the chances of a bigger fish making a mistake. A rock-hard hookbait was the answer to the nuisance fish. 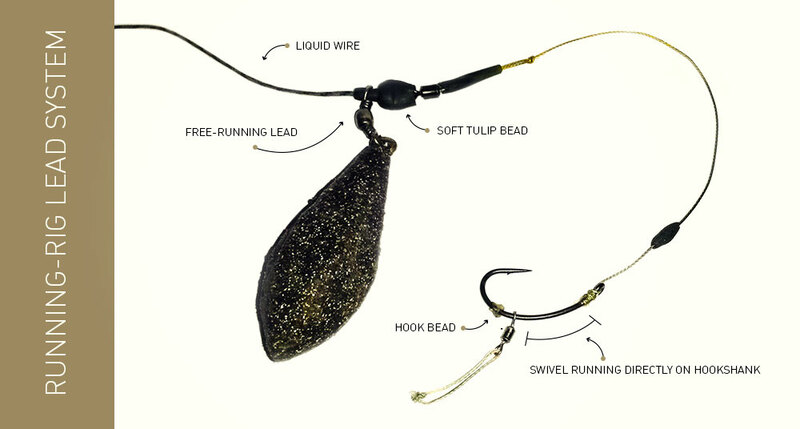 These baits were created by adding a substantial amount of egg albumin to the hookbaits, hardening them to a point where they had to be drilled. This solved the problem of the nuisance fish and the frenzied carp could not distinguish between freebies and the rock-hard hookbaits. That was the significant second piece needed to solve the puzzle. Any carp angler will tell you that there is no such thing as the perfect rig, but there is always a rig perfectly suited for the situation. The river is no exception. The first problem was nuisance fish tangling the hair, thus causing poor hookups and missing fish on the take. This issue was solved by adapting a D-rig type presentation. The end result was a very basic concept. A swivel sliding directly on the hook shank, stopped by a hook bead on the bend of the hook. The second problem was the rocky ledge. Any fixed lead or inline type lead system got stuck amongst the rocks, causing the carp to cut the hooklink. The next logical step was to fish safety clips, however, it became clear that this would be an expensive exercise as we sometimes caught in excess of 50 fish over a weekend. I adapted a normal running-rig lead system to suit the situation. At the bottom of the liquid wire, where the hooklink is joined with the swivel, I use a soft tulip bead to hold the lead in place. This is achieved by simply sliding the swivel (attached to the lead) over the bead. This then creates a bolt effect on the take, setting the hook properly. More importantly though; this setup helps with the rocky underwater obstacles. When the lead gets snagged you are still in direct contact with the carp. With enough patience you can bring the carp right to where the lead is stuck and he will almost always lift it out. That was the third important piece of the puzzle. Combining all these little edges, all the observations and knowledge gained through time spent fishing, could give you the perfect recipe for that carp of a lifetime. See every challenge as an opportunity to learn and improve your skills.